In the past Minho derbies have often been much more than simple football matches - often resembling pitched battles. Thanks in part to the non-incendiary nature of both managers (thanks, Tom), last night's match was no such thing and rather offered an entertaining spectacle, even if it wasn't exactly ridden with scoring opportunities. Guimarães came out strong of the blocks, relying on their 4x3x3 to pressure Braga high up and prevent their usual patient build-up play. Beto, for instance, was almost always forced to play the ball long, which is not how Braga manager José Peseiro likes his teams to launch their attacks. 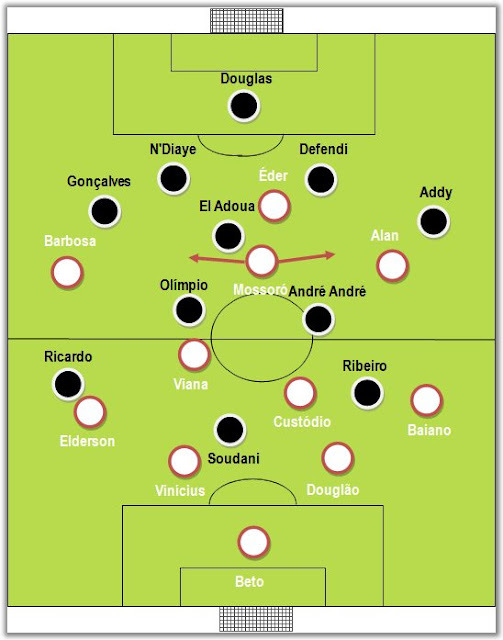 (In contrast, Doulgas, Guimarães' goal keeper, always looked upfield when he gathered the ball, trying to exploit the defensive spaces vacated by Braga players.) Furthermore, Leonel Olímpio and André André's positioning was designed to keep Hugo Viana from dictating the tempo and spraying his traditional diagonal passes. For the first 15 minutes, Guimarães were successful in their strategy, but Braga started settling down and gradually took over the midfield, softening their pressure on Viana and Custódio. With Olímpio and André higher up, there were pockets of space behind them that had to be covered almost exclusively by El Adoua. Mossoró was his usual self and was amazing with his lateral movement, drifting away from the Moroccan holding midfielder, too wary of leaving his area exposed. Guimarães' good game was in part due to their proactive wingers, who showed auspicious signs with their clever movement. Ricardo is a trickier player who favours one-on-one situations, while João Ribeiro reads the game better and is not afraid to occupy other areas of the field, in order to create harder situations for his opponent. While it's true they were busy helping out by going up and down the wing, it's only fair to point out that they progressively let go of their defensive duties. On one hand, Guimarães,encouraged by their fans, seemed to have an emotional grip on the match. On the other hand, Braga were apparently better equipped for the different stages of the match, even though they looked a bit disjointed at times, especially the ineffective Alan and Hélder Barbosa. The first cagey half had showed little between the two teams. The second half was basically a one-way street. With a better idea of what to do offensively, Braga ended up scoring the first goal, in a quick transition into attack after a free kick in Guimarães' attacking half. The emotional upper hand Guimarães were benefiting quickly deflated after the goal, despite their immediate attempt to push forward. 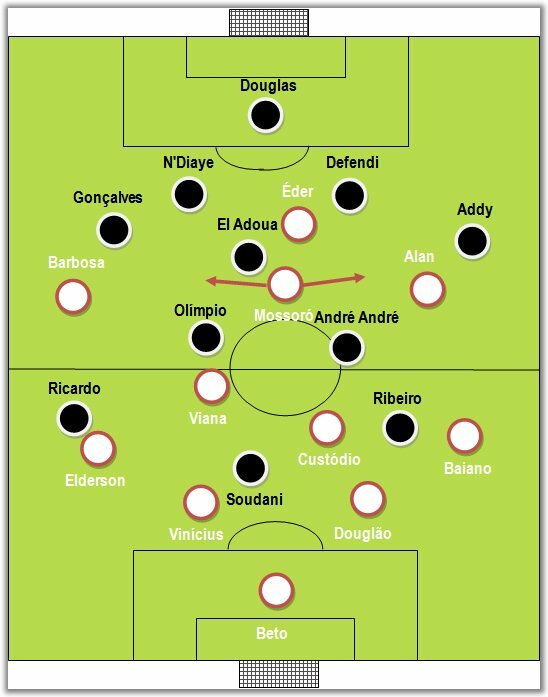 As so often is the case with Portuguese teams, Rui Vitória's men seemed unsure of where to go after finding themselves trailing - truth be told, the lack of depth of Guimarães' team was clearly on display here, with not many alternative attacking routes. To make matters worse, Peseiro chose to rest Mossóro and replace him with Ruben Micael. The former FC Porto player was instrumental for Braga to seize control of the match and disturb a possible comeback from their opponents. Furthermore, Éder is out to prove he may well be the future striker the Selecção and Braga need by proving to be a reliable attacking focal point, able to hold up the ball and linking up play. Braga's second goal was just a final fait-divers and a bonus for Hugo Viana. Is 4x3x3 about to come back?